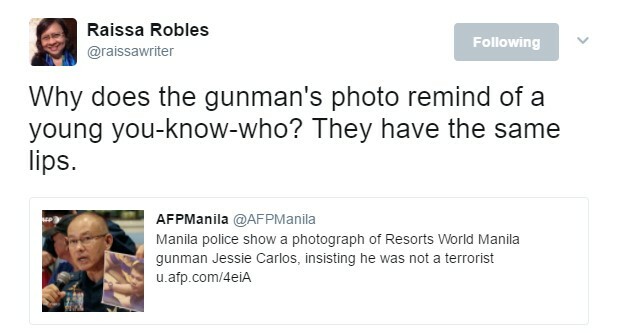 Home / Entertainment / News / Raissa Robles fantasizes about Resorts World attacker's lips - "They have the same lips"
Raissa Robles fantasizes about Resorts World attacker's lips - "They have the same lips"
"Why does the gunman's photo remind of a young you-know-who? They have the same lips." The ever colorful Raissa Robles tweeted. Tweets like this is very unusual for someone who claims to be a top-tier investigative journo. Has she lost her mind? This only proves how skewed her mind is. Nilamon na ng kasakiman. She is trying very hard to connect his hatred for Duterte - even the most unrelated issues. Is this the kind of journalists the Philippines got? I feel sorry for the media industry. I know a lot of journalists whose integrity are unrivaled and it only takes one Raissa Robles to tarnish the reputation of these entire industry. Journalists are supposed to be watchdogs, not pimps. Raissa Robles is a mad woman. Period.